Moving every possession you own is a big deal, and you want to make sure your items are protected against any type of potential loss or damage. When you work with Bekins, you can count on our expert movers to do everything they can to ensure the safety and protection of your shipment. But that doesn’t mean you shouldn’t consider extra moving protection. A protection plan will help alleviate worry about your upcoming move since you know you’ll be compensated if anything were to happen to your items. Limited liability protection is provided to you when you work with Bekins. It values your belongings based only on weight, and gives a valuation of sixty cents per pound/per item. 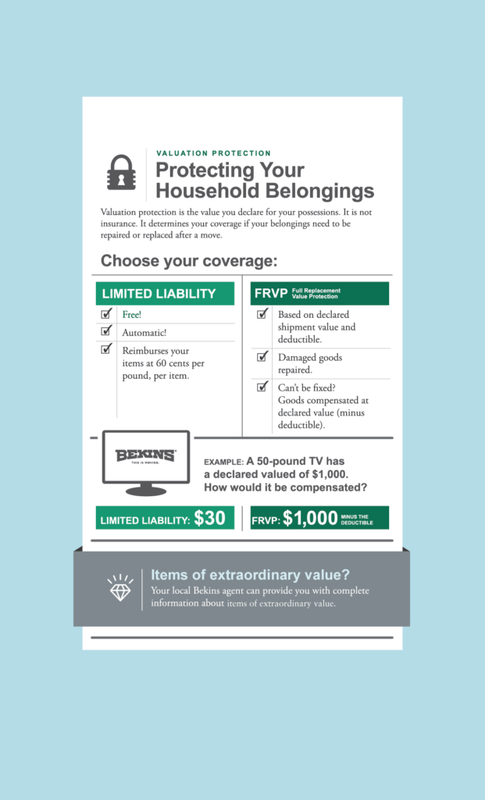 In the event of a claim settlement, you’ll be compensated at this rate no matter what the item—in other words, a television will be compensated at the same rate as a dining room table. Please note, the liability coverage for boxes that you pack yourself is not the same as the liability coverage available to you for carrier-packed boxes. Items damaged inside boxes you pack aren’t covered by the valuation policy. However, if the items are damaged because the boxes themselves were damaged during transit, the valuation policy could apply. Full protection provides a higher level of compensation if there is any damage to your items, and is a great way to protect your move. Unlike insurance, we’ll place a dollar amount on your items based on a declared value that you set as well as the deductible level you choose. Our Full Replacement Value Protection (FRVP) policies are based on a release value of $6 per pound. For example, if you choose to purchase FRVP on your shipment that weighs 10,000 pounds, your shipment’s default value is $60,000. You can increase that value to a larger amount if you choose to do so. It’s up to you to assign a protection amount for your items of extraordinary value, such as antique furniture. items hold a value in excess of $100 per pound. Based on the value you assign, we’ll charge you a calculated rate for protection. You can also choose to have a deductible assigned to items of extraordinary value if they need to be repaired or replaced once determined by our assessment. If you have any questions about how much value to assign to a specific item, be sure to consult with your agent. All items included in your shipment considered to be of extraordinary value must be identified on the Items of Extraordinary Value Inventory Form. Taking inventory upon delivery is not only a good idea, but required to ensure your items are covered properly. By comparing items to your inventory form, noting any damages, and noting that all items have arrived before your driver leaves, you’ll ensure your valuation coverage can be applied to your shipment in full. Have any questions about moving protection and valuation? Contact us or your local Bekins agent for more information.